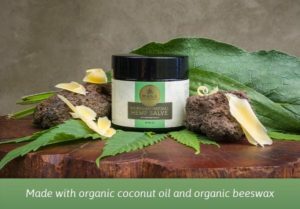 A soothing, topical blend of phytocannabinoid-rich organic hemp extract, organic coconut oil, Honaunau Farm comfrey, organic Hawaiian beeswax, Honaunau Farm plantain, & therapeutic essential oils. This salve delivers 300mg of extract in every 2oz jar. It has a silky texture and aromatic profile. It feels nourishing on the skin and has been used for many topical applications.